Europe’s first Mars landing mission is due to get under way next spring. At last week’s European astrobiology meeting in the Netherlands, Jorge Vago of the European Space Agency gave a status report on the upcoming ExoMars (Exobiology on Mars) mission, which was especially timely after recent encouraging news about more life-friendly conditions on Mars. ExoMars is a three-part mission. The ExoMars Trace Gas Orbiter and a small stationary lander called Schiaparelli are on schedule to be launched next spring, with arrival at Mars on October 19, 2016. The larger ExoMars rover scheduled for 2018 might be delayed to 2020; potential landing sites for the rover will be narrowed from four to two later this month. The instruments onboard these different ExoMars spacecraft are impressive. As its name implies, the Trace Gas Orbiter will be able to detect gases in the Martian atmosphere down to exceptionally low limits. Methane, for example, can be measured down to 25 parts per trillion at solar occultation (when the spacecraft is looking back at sunlight filtering through the Martian atmosphere). This accuracy will be extremely useful in determining whether methane previously detected by NASA’s Curiosity rover in the parts-per-billion range may have a biological source. The Schiaparelli lander is supposed to make a soft touchdown at Meridiani (the same region where NASA’s Opportunity rover landed in 2004) and will demonstrate entry, descent, and landing technologies for the 2018 rover mission. It also is the first probe able to detect lightning on Mars (if it occurs). The crown jewel of the ExoMars mission is the 310-kilogram (683 pounds, or a third of the mass of NASA’s Curiosity) heavy rover, which will be able to drill down two meters (about six feet) into the subsurface. This is critical to obtain a sample that might contain interesting organic compounds and possibly life, as any samples down to about four feet are expected to be degraded by the harsh radiation environment on Mars. In addition to rolling, the six-wheeled rover is able to walk like an insect or move sideways like a crab to overcome obstacles. Further, it carries Ground-Penetrating Radar (GPR) and a Neutron Spectrometer (which can detect hydrogen atoms, from which we can locate water) to help in deciding where to drill. The most exciting instrument, however, is the Mars Organic Molecule Analyzer, or MOMA, which can detect organic molecules at extremely high sensitivities up to an atomic mass of 1,000, and determine their chirality, or handedness. Many NASA scientists will be collaborating on MOMA, even though NASA officially pulled out of the project after the agency had to cut its budget in 2013. After that the European Space Agency searched for a new partner, and found it in the Russian Federal Space Agency (Roscosmos). 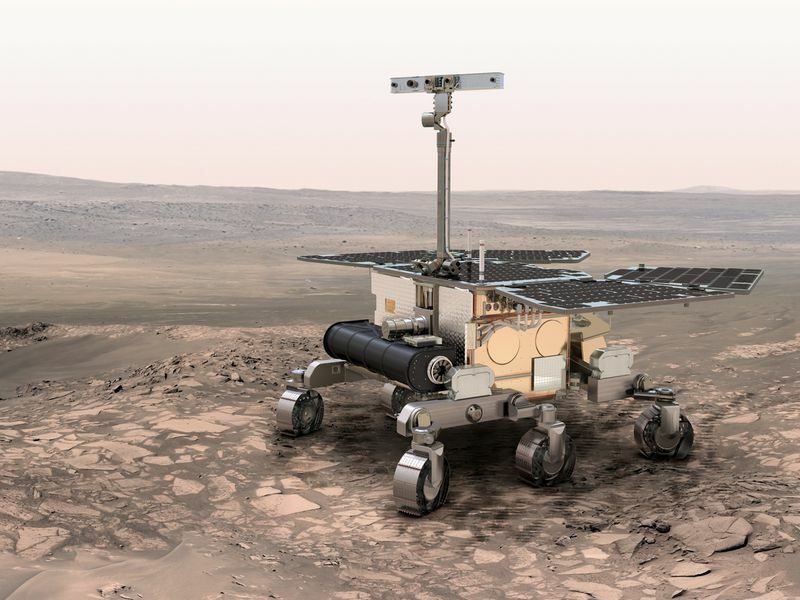 If all works as planned, the ExoMars rover is the first mission since Viking in the 1970s that has a realistic chance to detect past or present life on Mars. Could the Colorado Plateau Be an Ancient Impact Scar?